The ambitious program to collect the short fiction of Grand Master Jack Williamson continues! Of the 10 tales in this collection drawn from classic pulp magazines—Unknown, Thrilling Wonder Stories, Super Science Stories, Marvel Stories, Comet, Argosy Weekly, Startling Stories, and the rare fanzine Stardust (three of which are full-length novels! )—nearly half have never been reprinted before. Featured is the original novella-length version of “Darker Than You Think” and the magazine texts of “The Reign of Wizardry” and “Gateway to Paradise” (previously published as Dome Over America.) Also included is Williamson’s afterword with his recollections on the genesis of these tales and the pre-World War II science fiction field. Like previous volumes in this series, the full-color endpapers reproduce the original magazine covers (with artwork by pulp masters including Belarski, Cartier, Rogers, Bergey and Scott) of the stories herein, and the binding is designed to match the 1940s editions of Williamson’s works published by Fantasy Press. The book is smythe-sewn, bound in full cloth, and printed on acid-neutral paper, with full-color endpapers reproducing the original pulp magazine cover art. 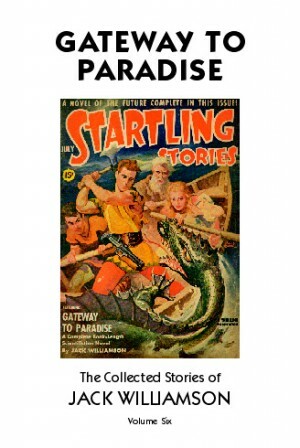 With a foreword by author, editor, collaborator, and long-time friend of Williamson (and fellow Science Fiction Grand Master), Frederik Pohl, Gateway to Paradise contains the sense of wonder from the early years of American Science Fiction and continues the documentation of Williamson’s unparalleled career.